Registered Nurses (RNs) are essential core staff in any healthcare facility. RNs work in hospitals, doctors’ offices, nursing and home healthcare facilities. Others work in the military, schools, and prisons. Career opportunities for registered nurses keep on growing. The reasons include an increase in the aging population that requires more health care, emphasis on preventive care and high rates of chronic conditions such as obesity and diabetes. There is also an increase in the number of expectant mothers and babies. Applicants seeking to license by endorsement must produce a current RN license in another territory or U.S state and license verification by the issuing board. Nurses seeking a temporary license to must meet the same conditions to practice for 6 months while waiting for a permanent license. RNs must renew licenses every two years after the date of issue. To become a licensed RN Alabama requires you to get the right education, pass the NCLEX-RN (National Council Licensure Examination-RN) exam and get licensure. Alabama State Board requires you to pay application fees, provide proof of American citizenship or legal presence. If you have a license from another state but need to practice in Alabama, you need to apply for licensure. You should request the original board to verify and mail your license to Alabama Board. After getting licensure to practice in Alabama, you join more that 45,000 RNs employed in the state. The average annual salary for RNs in AL is between $55, 870 and $67,000 while the mean hourly wages are $26.86. The average pay is 1% higher than that RNs working in other states. More than 90% of the nurses earn over $40,740 but less than $73, 640. Out of this percentage, 50% of registered nurses earn over $54,490 while the other half makes less than this amount. Work profile, location, education level, the industry, and experience are some of the many factors affecting your income directly or indirectly. You are unlikely to earn a lucrative salary when you are direct from medical school. You will enjoy better prospects when you gain more on job knowledge and experience. Huntsville, Tanner, and Madison are the top-paying cities in AL with median annual pay of $66,911. The lowest paying city is Georgiana where median hourly wages alter between $28 and $32. There is a broad range of areas and positions where RNs can work for varying salaries. Registered nurses who rise to become Clinical Nurse managers or RN first assistants are the highest earners. Have no Idea on how to Acquire a Licence as a Registered Nurse? 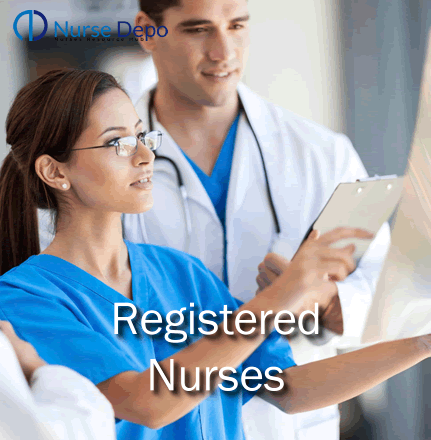 Nursedepo.com ready to assist you.To practice as an RN requires a license from the state where a nurse intends to work. Alaska Board of Nursing licenses registered nurses in the state. A person qualifies for RN licensure by completing and associate or BSN degree. Nurses who complete their education within Alaska get their licensure by examination after completing their educational requirements. Some of them benefit from a funding program that caters for repayment of their student loans. Nurses with licensing from other jurisdictions can get a state license by endorsement, but Alaska is not one of the nurse compact states. A nurse who is licensed elsewhere still can only practice in Alaska after getting its nursing license. Licensure candidates can seek a temporary permit with program verification even without the official transcript. The license is valid for six months within which the candidate must pass an NCLEX-RN exam. Failing the exam leads to invalidation of the temporary license. Alaska might be one of the top paying states in the U.S, but the average earnings for registered nurses in Alaska are 26% lower than the national average. The salary levels depend on aspects such as job profile, setting, experience education and location among others. Only 10% are in the highest salary bracket of over $110, 770. 50 percent of nurses in Alaska earn over $83, 370. There is a 10% of RNs making less than $61,720. Juneau is Alaska’s highest paying city with a median salary of $77,904 per annum and $6,492 per month. Sitka is the lowest paying city with median hourly wages of less than $37, the average in other cities. There are job employment openings new RN job openings for the fresher and experienced nurse at health service facilities and health consortiums. Alaska hospital outpatient services are projected to grow rapidly thereby creating new openings. Alaska has a mix of full and part-time jobs. These include day and night shifts. Arizona has a large and still growing population. It increases the prospects of a productive, rewarding career for registered nurses. There three routes to practice as an RN in this state. You practice after earning your BSN or ADN degree then pass an NCLEX-RN exam to qualify for registered nurse certification. These comprehensive exams test if you are ready to join the workforce and take responsibility to take care of the patients in stressful situations. Pass marks are usually high. You may also enroll for LPN nursing program that takes one year largely focusing on patient care then complete an LPN-RN nursing program. After that, you will take an NCLEX-RN and get licensure if you pass. The average annual salary for registered nurses is Arizona $55,000-$64,000. The average RN earnings are lower than the national average by 18%. More than 90% of RNs earn $52,540 but only 10% earns over $92,700. Half the registered nurses in Arizona earn less than $71, 010 and 10% of the employees earn less than $52, 540. Yuma is the city with top salaries in Arizona with a median annual salary of $70,527. Most of the employers in other cities pay nurses an average of $32 hourly earnings, but the rates are lower in Sierra Vista. The number of employed RNs in Arizona is close to 50,000 hence the overall outlook for nursing career is quite decent. BLS (Bureau of Labor Statistics) expects a 22.2% growth in job opportunities for registered nurses in Arizona up to 2018. The increase of the aged people and need to replace professionals who will retire within the few coming years as well as easier access to health care services are major reasons for increased demand for RNs. Arkansas State Board of Nursing issues certification for registered nurses in the state. You hold an RN license as mandated by Nurse Practice Act. A registered nurse licensure increases your marketability, credibility, and potential to earn a better salary. You are eligible to earn an RN licensure in Arkansas when you graduate from a bachelor, associate or diploma course from a recognized school. After that, you must pass your NCLEX-RN examination supervised by the state board. Nurses educated and licensed in other jurisdictions should validate their education program for the state board to determine if it is similar to Arkansas nursing program. An official transcript from te nursing program is the document you send to the committee for validation. The average hourly pay for Arizona registered nurses is $27 and over $68,000 average annual salary. It is higher than national average salaries by 2%. The percentile levels are varying. 50% of the registered nurses earn more than $55,240. However, 90% of RNs earn less than $74,540. Still 90% earn over $39, 650. The demand for registered nurses is increasing. There are various job vacancies for them to work in various places like hospitals, physicians’ offices, nursing homes, schools, home for the aged, correctional facilities and other healthcare facilities. BLS anticipates that Arizona will absorb a significant number of the 1,039, 000 new job opportunities for registered nurses in the United States. Trained nurses intending to practice in this state have a reason to expect more jobs. Eligible candidates get their licenses from CBRN (California Board of Registered Nursing). The certification gives RNs legal authority for practicing in the state and assurance to patients that they have met the necessary standards. The development of the nursing sector in California is at a fast pace because of the constantly increasing population. It is the third largest city in the U.S making it an employment hub with more jobs for fresher and experienced nurses. The average annual salary for a registered nurse in California is $71, 000 to $96,000 depending on employer and place of work. Compared to national average, the salary is 7% higher to cater for a high cost of living in this state. 50% of RNs earn more than $94,000 which is within the average earning. The least earning RNs are the 10% earning a salary of less than $63,670. San Francisco, Richmond and Daly City are the highest paying cities ($84,000) while Visalia pays the least salaries with a median salary of around $70,000 per annum. Connecticut Board of Nursing in Department of Public Health issues nurse certification in the state. It also ensures that there are healthier conditions to prevent diseases, disability, and injury. RN job is 21.292 out of 1000 employment opportunities in Connecticut indicating that the state has over 35,000 registered nurses. The average annual pay for nurses is $77,000, and the wages are higher than the national average by 15%. Greenwich, Stamford, and Norwalk are the cities paying the highest median salary annually at $77,050. Some cities share the position of paying the minimum, the median salary of $72,111. These cities are Bristol, Hartford, New Britain, Waterbury, Meriden East and West Hartford. 90% of registered nurses earn over 55,480, but only 25% make over $88, 830. District of Columbia Department of Health issues nationally recognized license to practice. Licensed RNs salary in DC is $85,000 per annum which is 25% higher than the national average. Regarding hourly payment, 10% still earn lower than $47.73 per hour. Georgia is one of the highest paying states. The average annual salary is $76,000 which 14% higher than average RN salaries in job postings across the nation. Atlanta, Roswell, and Marrietta pay the highest salaries with a maximum average annual salary of $69, 466. Valdosta is the city with the lowest pay with $56, 978 annual median wages. Idaho Board of Nursing has the authority to register nurse certification in the state. Nursing salary increases depending on the specialty and experience. Idaho has over 12,000 serving nurses at an average pay of $44,000. Unfortunate it 34% lower than the national average. Twin Falls pay the lowest median salary. Registered nurses earn an average of $1,121 to $1,309 a week. Coeur D Alene pays the highest salary of about $1418 per week. For every 1000 employees in Indiana, 20 are nurses working in various healthcare settings. Before practicing, registered nurses get their license from Indiana Nursing Board. The average earning for RNs is $64,000. Although it lowers than the average RN salary at the national level, the difference is 4%. 50% of the nurses earn more than $57,370 but 40% of RNs make less than $76, 690. The average salary for RNs in Indiana cities does not fluctuate much for hourly rates that are between $30 and 32. The highest variation is in the annual average wage which varies from $61, 724 to $66,814. Gary and Hammond are the top-paying cities, and Lafayette is the lowest paying city. Kansas State Board of Nursing provides licenses for registered nurses. Nurses are the backbone of the healthcare industry in Kansas. The average pay for registered nurses in Kansas is $61,000 per annum. Experience, work schedule, certification and the workplace are some of the factors contributing to the amount of salary that a nurse earns. Geographical location also matters. Lenexa, Kansas City, Overland Park, Olathe and Shawnee pay the highest annual median income of $67, 792. The lowest paying city is Salina. It pays an average $58, 252 per annum. The Lousiana Board of Nursing protects health and life by issuing practicing licenses to registered nurses. The salary largely depends on working hours, settings, academic level, geographic location, and experience. Lousiana is widely spread and populous state with more than 40,600 RNs. It does not pack extremely high pay packages, and the average salary is 11% lower compared to other states. The mean annual income for RNs in this state is $61, 780 and $29.70 per hour. The top-paying cities are Kenner, Metairie, Marrero and New Orleans that pay an annual median salary of $66,363. Alexandria pays the lowest average annual salary at $56, 234. Maryland Board of Nursing has the responsibility to issue and renew licenses to registered nurses. May factors motivate nurses and salary is one of the original aspects. RNs is Maryland earn an average of $71,100 per year. The average pay is 3% higher in Maryland than the national average. A clinical nurse manager earns the highest salary while RN outpatient and psychiatry nurse get the lowest pay. Endoscopy, pediatric and postpartum nurses make an average of $60,000. Other nursing personnel earns from $61,000 onwards. Michigan Board of Nursing is the body with authority to issue practicing licenses in the state. Michigan has a high number of RNs, more than 91,000 showing that it has a good working environment for the professionals. The average salary for RNs in Michigan is at $67,000. It is 1% higher than what nurses in many other U.S states earn. Salaries vary according to geographical location. Other factors that make a difference in the payment are employers, availability, and competition. Muskegon pays the lowest RN salaries. The average earning for nurses is $63,600 per annum. Arbor, Ann, Canton, and Novi are the highest paying cities in Michigan. Runs in this place earn an average annual salary of $71,829. Mississippi Board of Nursing issues nurse certification offers a nursing license, a sort of legal permission for RNs to practice in the state. It is a form of assurance to patients that the holder has met all the mandatory standards. Mississippi has close to 30,000 employed RNs, but there are still opportunities for more. RNs nurses in the state get an annual average pay of $70,000 which is higher than average salary at the national level by 5%. Mississippi cities pay considerably lower salaries. The lowest paying city is Meridian with an average weekly pay of $991-$1258. The highest paying cities Southaven and Olive Branch that pay an average of $65, 402 annually ND $5, 450 weekly. Montana Board of Nursing issues certification for registered nurses wishing to practice in the state. It vets the applicant to ensure that residents get optimal health care service. Montana may be having more than 10,000 RNs, but there is still a high demand for more to serve the aging population. Technology advancement, economic pressures and a need for preventive care are the other reasons why the state will require more nurses. The average salary for registered nurses is $60,000, but unfortunately, it is lower than the national average by 17%. Kalispell is the highest paying city in this state where RNs earn a $ 62,544 median annual salary. The lowest paying cities are Missoula and Bozeman with an average annual salary of $41, 377. There are various nursing positions for specific responsibilities. RNs with additional responsibilities usually earn higher incomes. For instance, while most RNs make $49,000 to $55,000 annually, Clinical Nurse Managers earn $58,000 onwards. It is the work of Nevada State Board of Nursing to issues certification that licenses registered nurses through and exam or by endorsement. The aim is only to license those who can provide quality health care to citizens in the state. Nevada boast of 14 accredited nursing schools that provide adequate training and practical experience to prepare students for the licensure exam. There much need for nurses with various hospitals and healthcare facilities persuading colleges to prepare more graduates for registered nurse positions. Some even offer financial aid. The average annual pay for Nevada registered nurses is $51,000 which is lower than average national nursing salaries by 24%. The salary range from most nursing professionals is $44,000 to $50,000. The salaries vary from, one individual to another depending on experience and educational level. It also varies according to cities within Nevada. The highest paying city in the state is Carson City with a median annual salary of $71,236 and $34 hourly pay. Sparks, Reno and Sun Valley have the lowest annual median pay of $68,350. New Jersey State Board of Nursing offers certification for registered nurses to practice in the state. The board aims at providing proficient, organized nursing practice while protecting safety and health for the public. It has one of the highest numbers of nurses, over 75,000. Most registered nurses earn a salary of $69,000 to $62,000. The average salary for registered nurses in NJ is $72,000 which is 8% higher than average wages in the country. New York State Education Department issues certification validating competence of registered nurses to take care of the patients. New York is a large state, and over 170,000 RNs work in various facilities within the state. It is one of the top paying states for Registered nurses to compensate the high cost of living. The average annual salary for RNs is around $80,000. It is greater than average RN salary for the job postings in the U.S by 21%. RN Outpatient oncology and psychiatric nurse are the lowest earners getting around $69,000 annually. Many registered nurses in NY metropolises earn lucrative pay. The highest paying municipalities are the Bronx, Queens Village, Staten Island, and Brooklyn New York. They pay an average annual salary of $81,217. Binghamton pays the lowest annual median salary of $63, 377. Registered nurses working in New York also get these benefits as a reward or to give them an advantage. North Dakota has a State Board of Nursing that licenses nurses to carry out nursing practice in an organized and effective way. It has over 8,000 nurses. Registered nurse salaries in North Dakota are 11% lower than that of national level. The average annual salary at ND is $60,000. The degree that an RN holds and place of work are major influencers of the salary. The highest remuneration is in the cities of Fargo and West Fargo where the annual median salary is $65, 196. Registered nurses get certification and license to offer health care from Oklahoma Board of Nursing. RN earn an average annual payoff $61,000 which is lower than national RN average salary by 8%. Salary range like in many other states fluctuates significantly. Nurses at Muskogee earn the lowest annual average salary of $55, 676 and $27 hourly. Arrow and Tulsa are two cities paying the highest salaries in Oklahoma. RNs here earn an average median salary of $ 65, 526 per annum. For nurses to carry out duties without obstacles in Pennsylvania, they have to get RN Licensure after completing a state-approved training and passing NCLEX exam. Pennsylvania Board of Nursing issues the licensure for it to determine if a nurse is qualified to promote safe health nursing service. It also displays a commitment to the profession. Pennsylvania is among the top 5 highest RN employing service. It has more than 125,000 registered nurses. Nurses in the state occupy 22 out of 1000 jobs. The retirement of serving nurses, increase of aging population and existence of many health services makes the prospects of the part and full-time RN employment opportunities to be bright. RNs in Pennsylvania earn an average pay of $64,000. The salary figures are less than the mean wages for healthcare workers at the national level. Pennsylvania has a huge variation in the pay by RNs according to regions in the state. The cities offering the highest salaries are Levittown and Doylestown that pay an annual median salary $81,217. The median weekly and hourly pays are $1,562 and $39 respectively. Annual earnings for registered nurses in the other cities fluctuate widely from between $63,715 and $74, 687 while hourly income varies from $31 to $36. Clinical nurse managers and RN Assistants make the highest annual salaries of over $60,000 in all cities. Nurses in PA get these fringe benefits to motivate them and augment commitment. For one to practice as a registered nurse in South Dakota, one must prove that he or she is qualified to offer safe health care to patients in their recovery. South Dakota Board of Nursing issues licenses for RNs to practice in SD. Over 12,000 nurses work in this state. Regarding RN location quotient, South Dakota has the highest in the USA. The salary is lower by 25% than the average from nursing professionals at a national level. The average annual salary for RNs in this state is $50,000. Various cities in SD pay varying salaries because of factors unique to their locality. Watertown pays the lowest wages as RNs get a median annual salary of $39, 916. Median hourly pay at Watertown is $19. The highest paying city is Rapid City that pays an average of $62,799 annually and $30 per hour. After completing a nursing program in an approved school, Texas Board of Nursing requires RNs to pass a state administered NCLEX-RN exam to get a License to practice. Texas is the second highest employer for registered nurses. It has 190,090 employed RNs. Registered Nurses in Texas earn an average annual income of $68,000. The figure is lower than average income for RNs nationwide by 3%. TX has great fluctuations in the highest and lowest median salaries in the different cities within its borders. Houston and Pasadena pay the highest salaries. The average annual pay for nurses in these cities is $ 69,294. The lowest median annual pay is $48, 602 at Odessa and Midland. Vermont Secretary of State issues nursing certification because it has the responsibility of the state to safeguard the residents from unscrupulous and incompetent practitioners. Upon getting their certification, nurses get job security, career flexibility, higher salary packages and other fringe benefits. There is a guarantee for nursing jobs even in times of employment crisis and an option for exploring different areas. There are over 6,000 nurses in Vermont earning an average salary of $59,000. The salary figures are below the national average income for RNs by 12%. The salary does not fluctuate much in the cities. All pay almost an equal salary except Rutland that pays a median pay of $64,160 annually, and $1, 234 weekly. Nurse certification in Washington allows fresher and experienced nurses who move into the state to start caring for patients at different settings. Anyone seeking nursing certification gets the license to practice from The Washington State Board of Nursing. Although it occupies land on Maryland and Virginia states, Washington DC is the nation’s capital hence an essential part. It has approximately 55,000 nurses against a population of seven million hence there will be a steady demand for new nurses. Because living cost is higher in capital cities, the average RN salary in Washington is greater than nationwide earnings by 3%. The average annual pay for professional RNs in Washington is $69,000- $76,420 depending on factors such as location, certification level, and specialty. Hourly, monthly and annual earnings for Washington’s RN vary widely. Richland pays the least salaries with a median annual pay of $65,700 while Bremerton paid the highest salary per annum, $74,460. To get nurse certification empowers the recipient to carry out the responsibility of caring for the patients and offering preventive health care service. In Wisconsin, it is upon the Department of Safety and Professional Services to license registered nurses and ensures the safety of their services. The number of registered nurses working in Wisconsin is over 57,000. The state has a population of over 5 million residents hence there is still a large gap for from newly graduated RNs. The average income for RNs in this Wisconsin is $59,000 annually. At least half of them earn $63,000 upwards. Janesville is the highest paying city in the Wisconsin. The average salary for nurses in this town is $69, 294. Wyoming State Board of Nursing issues registered nurse certification after certifying that a nurse is well trained and qualified to offer healthcare. There are several nursing schools in Wyoming prepare aspirants for their licensing exam. Registered nurses who advance their education are more likely to join higher positions, get specialized roles, and attractive pay packages. Wyoming has 4,500 registered nurses working at various health facilities within the state. There is room for more RNs as the population n the state is still increasing. Nurses serving in Wyoming earn an average salary of $55,000 per year. Education, work position, experience, geographical location and it living cost influence the salary that RNs receive. RNs who need the highest salaries can apply for jobs at Casper or Laramie. They pay the highest annual salary of 62,799 and $30 weekly. Colorado Board of Nursing issues RN certification in the state giving successful candidates an authority to practice here. The average annual pay for nurses for registered nurses in California is around $60,000 which is 11% lower than national average nursing salary. Half of the nurses earn more than $68,080. 90% of the nurses make more $49, 860 but there is still 10 percent earning less than $49,000. Geographical location also affects the amount of salary. Boulder has an average annual salary of $71, 064 and an hourly wage of $30-34. Jefferson City pays the lowest salary in Colorado at $62, 668 per year. A rapid increase in population, healthy reforms and high demand for nursing services brightens the future for Registered Nurses in Colorado. Delaware, the second smallest state in the USA, has a Delaware Board of Nursing to issue Nursing Licensing. Despite its small size, there are approximately 10,000 practicing nurses. Average salary per annum in the state is below the national average RN salary by 12%. The average earning for registered nurses in Delaware is $58,000. Most nurses earn $50,000 to $74,000 annually. Cardiovascular operating room, renal dialysis, radiology, first assistants and clinical nurse managers earn a higher income. Dover city pays the lowest nursing salaries. The median month pay is between $5,960 and $ 6,224. Florida is the fourth highest registered nurses employer with over 163,000 employees at this position. Florida Board of Nursing licenses registered nurses. Average annual salary for RNs is $62,000 which is reportedly lower than the national average by 7%. Salary varies from city to city depending on the living conditions and demand for professional RNs. The highest pay ($66,587 per year) is in Fort Lauderdale, Boca Raton, and Hollywood. Pensacola pays the least median salary per annum at $61, 421. Hawaii pays the second highest salary in California. The pay for each varies according to factors such as advanced education and additional certifications. Some of the nurses end up getting a pay lower than the national average by up to 38%. The average salary for registered nurses in Hawaii is $41,000. There is no major variation in the pay for registered nurses at different cities except Kahului and Hilo where nurses get a median annual salary $74, 770 and $36 per hour. The number of the aging population needing care and support has also increased significantly. Department of Financial and Professional Regulation is responsible for issuing of RN certification license at this state. Geographic area, education level, expertise and working hours influence the kind of pay a registered nurse earns. IL has over 110,000 nurses who are a very high number. The average salary for RNs is $66,000 to $76,000. It is more than national RN average salary by 13%. Salary in many Illinois states is satisfactory for fresher and experienced nurses. The average annual salary ranges between $60, 271 and $72, 435. Champaign pays the lowest salary. Technological advancements in healthcare and population explosion have increased the need for registered nurses throughout the USA including Illinois. Registered Nurses practice in Iowa after getting their license from the state’s Board of Nursing. Over 33,000 nurses work here making up 21 for every 1000 employees. The average salary for RNs is 65,000 per annum is $65,000. It is 2% lower than RN average pay at the national level. There are significant pay deviations in various cities. Competition, experience, location, population, and employer are the main factors contributing to the differences. Ankeny, Urbandale Des Moines, and West Des Moines pay an annual median salary of $66,000 while Sioux City pays the lowest amount (average of $53,693) per year. The lowest earning group is 10% of RNs who earn less than $39,700. The majority of RNs make around $52, 610. Kentucky Board of Nursing awards RN certification in the state. The annual average earning for Kentucky registered nurses is $57,000. Although the average salary figures in Kentucky are lower than the national average by 14% according to Bureau of Labor Statistics, this state still has a high number of RNs. It has close to 45,000 nurses masking up 24 for every 1000 jobs. Specialist nurses earn more. Renal dialysis, interventional, cardiovascular and radiology nurses are among the highest earners. Maine State Board enhances satisfaction rate amongst patients and lowers probability of errors by ensuring that it assigns practicing nurses to qualified registered nurses. The salary for a registered nurse in Maine is higher for those with higher experience level and advance certification. When compared to other professionals ordinary RNs earn lower. Due to increasing demand, chances are greater that they will receive a more decent and adequate salary package. The average annual nursing salary in Maine is $59,000 which is lower by 12% than the national average. Some cities pay better salaries to RNs. Biddeford, Saco, Portland, Westbrook, Portland, and Windham are the highest payers with a median annual salary of $70, 982. Clinical nurse managers are the highest earners at an average of $62,000 per annum. All other professional nurses earn $51,000 to $58,000. Professional Credential Services issues a certification to licensing RNs. It is one of the favorite states for registered nurses because of more job prospects and career advancement chances. There are over 80,000 registered nurses at various health care facilities. After California and Hawaii, Massachusetts has the third highest salary for RNs. The annual average nursing salary for RNs is $80,000. It is 20% higher than what nurses in other states earn. Massachusetts is a state with many cities and paying different salaries and employment benefits. Most cities in this state pay an average salary of $74,391. Pittsfield is the City paying the lowest salary, $70, 754 but it is still high than the highest in some states. The wage range for many professional RNs is $70,000 to $79,000. The good pay at Massachusetts balances the high living cost in this state. It is also a place with constant demand for nurses hence the job prospects for fresher nurses are bright. Minnesota Nursing Board work issues licenses to registered nurses and other healthcare professionals who intend to practice in the state. It has a responsibility to ensure that whoever gets a license can offer secure and safe practice. There are close to 60,000 nurses practicing in the state. RNs in the state earn annual average income is $58,000. The figure is lower than the salary in other countries by 13%. Geographical locations also determine the number of wages that a nurse earns. RNs in most Minnesota cities earn a median annual salary of at least $72,084 and $35 an hour. Rochester and Duluth are the lowest paying cities as the yearly average pay RNs stands at $63, 646. Registered nurses get their licenses from Missouri Board of Nursing. Missouri has over 65,000 employed RNs. 25 out of 1000 jobs in the state belong to nurses. Nurses here earn an average annual salary of $65,000 which 2% lower than the national average. Some factors such as cost of living in the region of service, work settings, education level and experience affect the pay at various locations. Kansas City, Independence, Blue Springs and Lees Summit are the cities paying some of the highest average salaries to RNs. Nurses in these places earn an average $ 5,650 and $33 monthly and hourly pay respectively. Clinical nurse managers are the highest earners getting an annual salary of $68,000 onwards. Nebraska State Board of Nosing has to issue an RN certification to for a nurse to practice in this state. There are more than 20,000 employed RNs in this with many accredited nursing schools showing there is still an opportunity for more nurses. The background of an individual and economic background is some of the variants that control the amount of salary that registered nurses earn. Nurses Nebraska is in the average salary bracket of $43,000 to $49,000 annually. This range is lower than the national average by 27%. Cost of living and geographical region are other essential factors that employers use to calculate salaries. Bellevue and Omaha are the highest paying cities in Nebraska. Registered nurses in these cities earn an average of $65, 140. North Platte pays the lowest median annual salary of $48,450. Psychiatric and RN outpatient nurse receive the lowest income an average of $42,000. New Hampshire Board of Nursing issues a nursing certification to safeguard against inappropriate and unqualified nursing services. NH has several nursing schools that train and prepare for the licensure exam. The state has over 12,000 nurses. The average annual salary for RNs is $66,000. The salary is higher by 15% than the national level average. Many professionals earn $58,000 to $65,000. It is the trend by RN to take advanced degree courses. It boosts the salary as those in higher designations are entitled to more money. Keene City pays the lowest annual median salary of $69, 852 and $5,821 monthly salary. The highest annual remuneration is $72, 738 per year at Concord, Bedford, Merrimack, Manchester, Salem, and Nashua. Nurses planning to practice in NM start by applying for a license from the New Mexico Board of Nursing. The state has 15,000 nurses, but the number is still relatively small compared the population of two million residents. It means RNs at entry position, and those in training will get jobs. The average annual salary for RNs in New Mexico is $64,000. Education, work experience and the type of nursing work you perform will determine your salary. The location also influences the salary as various cities have different living standards. Rio Rancho and Albuquerque pay the highest median salary of $63, 450 per annum. Roswell pays the least income, $38, 677. Registered nurses in North Carolina analyze and help patients by providing them with the best healthcare after getting their certification. North Carolina has more than 90,000 RNs. Some nurses work in specialist positions such as ambulatory, cardiac electrophysiology lab, psychiatric or oncology nurse. 22 out 100 employed people in this state are nurses. RNs in NC earn an average annual salary of 63,000 which is 5% lower than the average salary for RNS in the nation Employers consider education level, certification level, experience, specialty, hours worked, ranking and the geographic location. Wilmington is the city with the lowest salaries. The average is $58,989 annually and $28 hourly. The highest average annual salary is $68, 729 in the cities of Concord, Charlotte, and Gastonia. Ohio Board of Nursing licenses registered nurses in the state to work in clinics, laboratories, hospitals and schools forming a larger section of health care industry. It is a state with a high number of nurses, over 125,000. Registered nurses pay average annual salary in Ohio is 64,000. It is 4% lower than the average at the national level. Geography is one of the factors that contribute to the salary level. In Ohio, Portsmouth pays the least annual average salary of $62, 179. Lakewood, Cleveland, and Euclid pay the highest average paycheck in Ohio ($68,655). Oregon State Board of Nursing has authority to issue RN certification in the state. The state of 30,000 RNs pays an average annual salary of $64,000. It is lower than average RN income at the national level by 3%. Oregon is the ninth biggest state in the U.S hence there is still a high demand for nurses. Many cities in the state pay handsome packages, but some still pay lower than average. Eugene pays the highest annual median salary of $73, 289 while Bend has the lowest annual median wage of $60, 512. The average annual income for RNs in other cities of Oregon is between $62000 and 72,000. Rhode Island Department of Health issues certification for registered nurses to practice in the state. You get their license by passing the NCLEX-RN exam or by endorsement. You can start working soon after getting the license. Rhode Island has one of the highest concentrations of nursing jobs. It has more 12,000 registered nurses working in various healthcare settings. Out of 1000 employment positions in the state, RNs take 25 of them. Nurses earn an average annual salary of $ 62,000 that is 9% lower than the national average salary. Nurses in Rhode Island enjoy these opportunities regularly to cater for their welfare. Department of Labor, Licensing and Regulation issues nursing certification in South Carolina giving practicing authority to registered nurses in the state after completing their nursing degree program in an approved school and passing an NCLEX-RN examination. North Carolina is a member of Nurse Licensure Compact (NLC) meaning that an RN licensed in another compact state can continue practicing even without obtaining a new license provided the current one is valid. Nurses from non-compact states must apply for a new RN license to become part of the over 42,000 RNs in South Carolina. Nurses in this state make an average annual income of $56,000-$66,000. The median hourly wage is $28.69. Some cities pay higher salaries. Rock Hill is the highest paying state where an RN gets an average income of $68, 729. Myrtle Beach is the city paying the lowest median salary. Nurses here earn an average of $58,962 per annum and $28 per hour. Nurses wishing to begin their career in this state should get certification from Tennessee Department of Health by examination or endorsement. RN nursing programs in this state include coursework that leaves students with the in-depth knowledge necessary for acquiring certification. The department safeguards and improves the health of the state's population. The number of nurses serving in various healthcare facilities and roles is 57,760. They make up 2.1% of the available jobs hence there are still many employment opportunities for fresher and experienced RNs. The mean yearly earnings for RNs serving in Tennessee are $56, 730 but it is lower than the national average by 7%. Job competition and cost of living create fluctuations of salary at various cities within TN. Median annual salary in different cities ranges from $56, 337 to $65,400. Jackson is the lowest paying city while Germantown and Memphis are the highest paying cities. Most RN professionals earn between $53,000 and $60,000 per annum. Employers in TN offer some of these benefits to registered nurses for them to flourish in their careers. Utah State Board of Nursing issues RN certification in Utah. It is a simple process that if you took your studies at a state approved school or training program. Certification opens up better job and salary prospects to practice nursing in Utah and other states. The average per annum income for Utah nurses is lower than national average RN income by 22%. Nurses in Utah earn an annual average of $52,000 to $60,000 depending on the job position and location. The cost of living in a certain city has much influence to the amount that someone earns. Logan is the lowest paying city in UT. RNs earn an average of $26 per hour and $1,050 a week. Salt Lake, South, and West Jordan are the highest paying cities. Their average pay to RNs is $31 per hour and $1,259 a week. Virginia Board of Nursing issues certification for registered nurses in the state after ensuring that they have met high standards of practice. Certification gives nurses a professional credibility and increases their confidence. Advanced certifications help in boosting chances to earn higher salaries. Virginia has approximately 60,000 nurses to serve as the population of over 8.2 million residents meaning that there is still a huge gap for RNs to fill. Nurses in this state earn an average annual salary of $67,000. It is among the few countries where nurses earn more the national average. Average RN salary in Virginia is higher by 1%. Salary in most Virginia cities is similar. The minimum, median annual wage for registered nurses is $61,000 Lynchburg. The hourly rates in this city are $29. West Virginia RN Board provides certification and licensure for registered nurses to work in this state. It is mandatory for applicants to pass their NCLEX-RN exam after successfully completing a state-approved nursing program. Registered nurses are high in demand, therefore, earn a good salary. Those holding a master or doctorate are in higher demand and get higher salaries as they can perform a full range or specialist service. The hold different job titles depending on the jobs they perform. There are close to 20,000 registered nurses working in West Virginia. The average RN salary in the state is $63,000. Cities in WV pay different wages. Living conditions as one of the factors that employers consider when calculating pay. Morgantown pays the highest average RN salary of $63, 494 annually. Nurses working in Huntington receive the lowest annual pay of $57, 653. Bureau of Labor Statistics (BLS) shows that need for registered nurses across all U.S will increase more than other occupations up to 2022. There will be job openings for them to work at various health care facilities including physicians’ offices, outpatient centers, hospitals, mental health centers, nursing care, school and correctional facilities. There is also a demand for nurses to take care of the increasing population of the aged and physically challenged. Becoming an RN at this time promises a great career ahead.